Behind every recipe there has to be a story. And behind this one there really is not much to tell. I was craving something sweet and chocolaty, and debating what to make, when I came across a recipe for vegan fudge that comes together in a bowl with no baking or complicated steps required. I love these types of recipes where the most “cooking” or “baking” you have to do is melt some chocolate. My go to recipes are different types of balls, or bon bons if you like, and I made some using pumpkin for a nice Thanksgiving treat, some using apples, walnuts, and dates, and a recipe that made them taste like chocolate chip cookie dough. This recipe takes me back to my childhood and reminds me of chocolates with chewy fruit and crunchy nuts that were so much fun to eat. For those of you who like your chocolate smooth, this may seem too weird, do keep en open mind. These bars have just the right balance of crunch, chewiness, coconut flavors, and chocolate that they will put a smile on your face in single bite. Plus: they have no added sugar, as they get plenty of sweetness from golden raisins. For the crunch you could use any mild tasting breakfast cereal, like crispy rice, corn flakes, or something like Cheerios. You can also skip cereal all together and go for some nuts. Chopped walnuts, hazelnuts or pecans would work really well in these bars; while cashews, peanuts or macademia nuts are probably not going to give you what you are looking for in terms of the flavor. For the chewy fruit component, golden raisins work really well, but you could use dark raisins or dried cranberries. No matter which one you decide to go with, before you use the dried fruit, soak them in hot water for at least an hour. The raisins will be plump and juicy after soaking, so you will need to drain them, pat them dry, and they are ready to go. If you are wondering how to melt the chocolate, you have two options: double boiler ad microwave oven. I use the microwave method where I combine the chocolate with a bit of cream or milk and microwave on high for 30 seconds. I take the bowl out, mix well, and put back for another 30 seconds. Mix again and repeat until most but not all (about 75-80%) of the chocolate has been melted. At that point the mixture has enough internal heat to melt the rest of the chocolate chips with constant mixing. This will give you smooth and well melted chocolate. If you are using a double boiler you will have to continuously mix the chocolate as it melts – don’t walk away! Having the chocolate go too far is not fun! The bars are really mix, pour and let it set type of treat. I recommend that you line your deep dish with some parchment or wax paper, and that you let these bars set at room temperature, which will take a bit longer than if you put them in the fridge. You should store them in the fridge, in a container with a tight lid, but for the best burst of flavor do let them warm up just a bit before biting in. Yummy! Soak golden raisins in some hot water for at least an hour. You want them to be nice and plump. Drain them, and pat dry them add to s large mixing bowl. Add rice crispies, melted coconut oil, and unsweetened coconut flakes. Mix well. Line an 8 x 8 (20 cm x 20 cm) baking pan with some parchment paper. Set aside. In a microwave safe bowl (or a double boiler) mix the chocolate chips with coconut cream (or milk or half & half), and melt the chocolate slowly. If using a microwave, check and mix your chocolate every 30 seconds. Pull the chocolate out when 75% is melted. Keep stirring and the residual heat will melt the rest of the chocolate chips. Pour the melted chocolate over the rice crispies, raisins and coconut flakes. Mix well. Pour the chocolate mixture into the pan, even it out, and leave in on the kitchen counter for at least an hour. This will allow for the chocolate to harden and settle. If you are in a hurry you can use the refrigerator – in that case the bars will be ready in about 15 minutes depending on how thick you made them. Take the chocolate out and let it come to room temperature before cutting and serving. These little treats are great on the go bites as well, so you may want to make a double batch! Crêpes are great – and if you ever hear anyone say otherwise you can safely assume that they don’t know what they are talking about or perhaps did not have an opportunity to try some. Perhaps they don’t know that plant-based, 100% vegan crêpes are easy to make, or perhaps they don’t or can’t consume gluten and are unaware that gluten-free crêpes are within their reach. Or, and this is the final myth that I will dispel, they think that only highly skilled and trained chefs can embark on crêpe making, which is far from reality. If you own a flat frying pan, and have a whisk that you are willing to use (or a blender! ), you can make crêpes. These light, thin, flat pancakes are versatile and can be made into a savory dish, like these Scallion Crêpes, or topped with a range of sweet toppings for a quick and easy breakfast or dessert. But, there is more to crêpes than that and I recently discovered that you can use them to make multilayered cakes! It usually takes 10-12 crêpes, nice, relatively firm filing, and topping of choice and you’ll have an impressive looking no-bake cake on your hands. I wanted to make my crêpe cake gluten-free as well, so I followed a crêpe recipe that uses chickpea flour since that was the the type of flour I had on hand (I found the recipe in The Chickpea Flour Cookbook by Camilla Saulsbury and I recommend you check this cookbook out because it does offer lots of gluten-free recipes with helpful comments on how to make each recipe vegan!). The recipe below is a slight modification from the original as I added more almond milk and some vanilla extract, and you should feel free to customize the flavors further or replace some of the flour with cocoa powder if you want your cake to be all chocolate all the way. Additionally, if you prefer to omit oil you can do that as well – here is another excellent and very simple recipe. The cake is easy to assemble and looks fantastic! If you are not sure you like chickpea flour you can use any gluten-free pancake mix and make a batter that is less dense than your standard pancakes. One way to test whether your batter is the way it’s supposed to be is to pour 1/2 cup in the middle of the pan and then swirl it around until the entire bottom is well covered. If your batter can do this you are all set, if not perhaps you need to add just a bit more water. Go slowly and test frequently, because you don’t want to end up with unusable slurry either. If you would like to add some sweetness to the crêpes, feel free to add a bit of maple syrup, agave nectar, or other sweetener you like. The chocolate filling and the ganache are quite sweet so you may not need this extra sugar. Making the chocolate filling is also simple – if you ever made pudding you will know what to do. The filling requires some simmering almond milk, starch and agar, as well we some dark cocoa and maple syrup, and needs to cook over low heat until dense. What kicks the filling up a notch is orange zest which adds citrus tones to the entire cake. You will need to let your crêpes cool then put the cake together by layering a crêpe then covering it with a tablespoon or two of the chocolate filling, then placing another crêpe on top, the the filling and so on and so forth until all the filling is used up. The last touch is chocolate ganache which you can make in the microwave, and pour all over the cake to completely cover the layers. You can decorate the cake with freshly cut strawberries, blueberries, toasted almonds, or some whip cream. Use your imagination to make it unique and incredible! Prepare egg replacer according to instructions. If using flax meal based egg replacer or similar the preparations may require soaking the flax meal in hot water for 5-10 minutes usually by mixing the dry ingredients with water in 1:2 ration (in this case 6 tablespoons egg replacer and 12 tablespoons water). Mix all the crêpe ingredients (except oil for the pan) using a blender, a mixer or a whisk. The batter should be smooth and clump free. Place a large frying pan over high heat. Use a brush to brush the oil across the hot surface of the frying pan, then pour in 1/3-1/2 cup of batter and twirl the pan around until all the bottom if covered with a uniform layer of the batter. Leave the pan over medium-high heat until the surface is completely dry, then flip the crêpe over and continue cooking for 2-3 minutes on the other side. Continue until all the batter is used up, and leave the crêpes to cool. For the filling start from cold ingredients and bring the almond milk to a gentle boil. Mix tapioca starch and agar powder into the hot milk and continue cooking over low hear until the mix firms up. Leave the mix to cool, which make take some time. You could make both the crêpes and the filling a day ahead and assemble the cake couple of hours before serving. To assemble this cake, please use a large plate or a cake stand and start by placing a crêpe on the bottom, then the filling (1-2 tablespoons), then another crêpe and more cake filling until no filling is left! To prepare a ganache, place the chocolate chips and milk, cream or half’n’ half into a microwave safe bowl and microwave on high for 30 seconds. Mix and microwave again, check and repeat until chocolate is about 60% melted. Take the bowl out and start mixing to help finish the melting process. Pour the melted chocolate ganache over the top and spread as evenly as possible over the top and around the sides. Decorate with fresh strawberries, set aside for 2-3 hours then dive in! A “Thank You” Cake, for All of You! 10000 views… I can’t believe that my tiny, homemade, low key, experimental, and very much just for fun blog recently hit a phenomenal milestone: 10000 views! I am still in a bit of disbelief about it all, to be quite honest and totally humbled, yet thrilled. Although I can’t explain how I went from my very first posted to 10000 views in less than 6 months, I’m guessing that this is a sign that there are many of you out there who are looking for guidance, inspiration and help in transitioning to 100% plant-based eating and cooking, while at the same time staying within a reasonable budget. I can only hope that at least some of you have found my recipes to be yummy, homey, inviting, creative, entertaining and pure fun, which is what this entire transition to vegan cooking has been for me. Thank you for joining me on this journey and for helping me along the way with your kind comments, suggestions and many, many engagements. 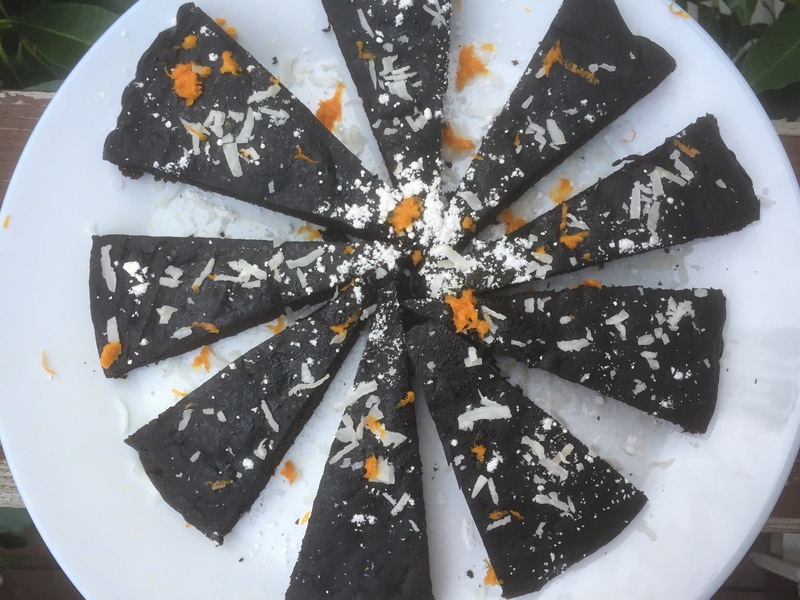 And… this being a vegan, plant-based, healthy cooking type of a blog I thought that it would be cool to say a huge “Thank You, All” with some cake. So, thanks everyone – I hope you enjoy this Dark Chocolate Brownie “Thank you!” Cake, and come back again for seconds!!! The recipe is super simple and uses ripe bananas as an egg replacement, and lots of dark, Dutch process cocoa. It also uses a simple trick to transform almond milk into almond butter milk by adding a tiny amount of cider vinegar to almond milk and letting it stand for fifteen minutes at room temperature before using. Finally, to help the dark cocoa release its color you will need to use some hot water. Putting all this together, you will start by mixing dry ingredients in a large mixer bowl separately from wet ingredients (all except water), combine them together and then add the hot water gradually as you mix, keeping a close eye on consistency. You want your batter to be smooth and fluid, but not completely liquid. The recipe below makes two 8 in (20 cm) round brownie cakes, or one 9 x 13 in (23 x 33 cm) rectangular cake. I recommend lining the bottom of your baking pan with some parchment paper, as this helps get the cake out. In principle you could bake this cake in a springform pan, and it should pop right out. The cake tastes rich and decadent, yet it’s relatively light in terms of the ingredients and especially in terms of added sugar. The bananas help not only hold the cake together, but add natural sweetness to it, so you can use 1/3 amount of sugar that a cake of this size would normally use. Of course, you are not limited to sugar and can use a sweetener of your choice, including artificial sweeteners if that’s what you like or need to use. Mix the almond milk with apple cider vinegar (or lemon juice) and let stand for 10 to 15 minutes. This will be your almond buttermilk. In a large mixing bowl, or the bowl of your standing mixer, combine all your dry ingredients (flour, cocoa powder, baking soda, and baking powder). In a separate bowl, combine all wet ingredients except the hot water. Note that powdered sugar and the bananas count as a wet ingredients. I recommend that you use a blender to cream your bananas, although you could simply mush them with a fork. Either way, make sure that your wet ingredients are fully mixed together and as smooth as possible. Next, slowly add your wet ingredients into the dry ones. For this, I keep my standing mixer runing on low, and pour the wet ingredients in, bit by bit. Let everything combine before adding the hot water. I recommend adding 1/4 cup water at a time, slowly so that you are in full control over the consistency of your batter. It should be smooth and pour out with ease. Line two 8 in (20 cm) round cake pans with parchment paper and pour the batter in. Put in the oven for 25 to 30 minutes. Take the cake out, flip it out of the pan, and leave it to cool for 1-2 hours. Cut into wedges and sprinkle with powdered sugar, coconut flakes and orange zest. Serve and enjoy!! !